Occasionally you will have to work into a ch-1 space directly in front of a single crochet. If you are not familiar with your stitch anatomy this can cause a lot of frustration. 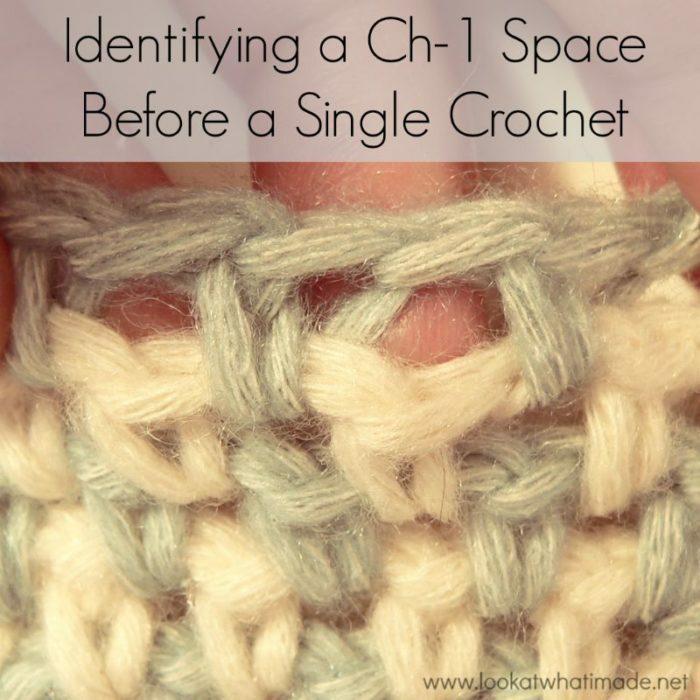 Today I am going to show you how to distinguish between the single crochet and the ch-1 space. Please note that this tutorial is written specifically for patterns that use (ch-1, sc) stitch combinations (like the corners of some of the rounds of Sophie’s Universe, or any Linen Stitch pattern). The best way to see where you need to insert your hook is to pull on your last row/round so that it stretches and opens up the stitches. The post of each single crochet consists of 2 ‘legs’ or posts on the front of your work, and 2 ‘legs’ or posts on the back. When you pull on your work like this, you will see that one of the back vertical posts stretches diagonally. The space to the right of this back vertical post is your ch-1 space. You should insert your hook to the right of the back vertical post to work into this ch-1 space. If you are left-handed, this space will be to the left of the back vertical post. The space to the left of this back vertical post is your single crochet. You should insert your hook to the left of this back vertical post to work into the single crochet. 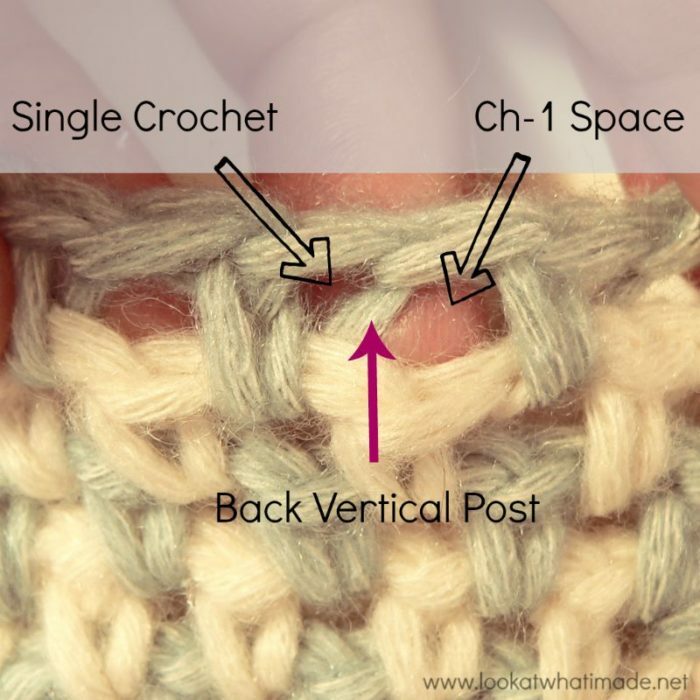 If you are left-handed, the single crochet will be to the right of the back vertical post. If you would like some more information on stitch anatomy, see my post about Corners and the Elusive Hidden Stitch. *skip next(dc, ch1-space, Sc, ch1-space) 2dc-Vstitch into next ch-space of the V stitch of previous row” repeat 59 times. Hi Rhonda. Could you email me written-out instructions for the previou row, the current row, and the next row so that I can have a look at the pattern for you? You can use the contact me tab at the top of my website to do this. Thank you! I now have to undo my entire project. I knew something wasn’t right! So glad I found this. Thanks so much for making this so simple! I’ve been crocheting for several years, simply guessing where to stick my hook!! Now maybe my projects won’t look so bad! this may save my crochet life – thank you!! Thank you soooooo much. I do learn how to deeply embed in my love”Crochet” with the great tutorials you kindly post. You just entered a new horizon of art to me and surely to many other fans. I wish you happiness and health forever. Awesome! I would always rather see the technical explanation then the usually poke it the dark I have survived on. I think the paragraph re the single crochet is a typo…. If it’s not, I am TOTALLY confused.